It's hard to believe that Starcraft 2 has been out for almost three whole years already. After more than a decade of waiting, I suppose a mere three years wait for the expansion is nothing. Starcraft 2 was released to great fanfare, and as something of a Blizzard fanboy, I counted myself among the excited. While I'm not typically one to play the multiplayer, I very much enjoy the campaigns and watching professionals duke it out. So when the first part of the Starcraft 2 trilogy, Wings of Liberty was released, I was quite eager to see what Jim Raynor had planned this time around. I devoured the campaign and was instantly eager for more. Roughly one week ago as of this writing, the second game, Heart of the Swarm was also released to the masses, and so I thought I would talk about my thoughts on it's campaign. Before reading on, be aware that this post will contain story spoilers for both Wings of Liberty and Heart of the Swarm. However, before I talk about Heart of the Swarm, I figured I should say a little about why I enjoyed Wings of Liberty so much. First and foremost, I think a big thing it got right was accessibility. Starcraft 1 and Broodwar were pretty notorious for being pretty difficult to play, both in terms of mechanics, and the actual difficulty of it's campaigns. Wings of Liberty had a wide range of difficulty settings though, meaning anyone who could hold a mouse could experience the entire game, while also providing challenge even to professional Starcraft players. It also had a very wide breadth of experiences. While the base game is always the same, pretty much every mission had you doing something different from every other mission. What's more, with a large amount of customization, there was a lot of room to tackle things using your own style. Tack on to that a great story (both in content and presentation) as well as the typical Blizzard level of polish, and you have what is easily one of the best RTS campaigns of all time. Now, Heart of the Swarm is a little bit of an odd beast in comparison. That's not to say it's bad, just decidedly different. Being the Zerg portion of the Starcraft 2 story, the game takes a bit of a different approach to things. In particular, upgrades are handled much differently now. Some upgrades can be switched around on a whim in between missions, while others are a single time choice between two evolutionary strands for a type of unit. These choices also provide you with a short mission to demonstrate the effect of each choice beforehand. Ultimately this system feels better, in that you have a lot more control over what your units play like, and you aren't likely to make a choice you regret. Each evolution available to your forces are also pretty awesome, and really lends a Zergy feel to the game, ensuring it doesn't just feel like Wings of Liberty with Zerg units. However on the topic of units, there are several of them that don't perform the same way as in the multiplayer. Now Zerg is a pretty strange race to play, so I can't really blame Blizzard too much for making some concessions for a smoother player experience. It can be pretty disconcerting though, whether you are a single player going to multiplayer for the first time, or the inverse. Enough about the mundane normal units though. Let's talk about Kerrigan. 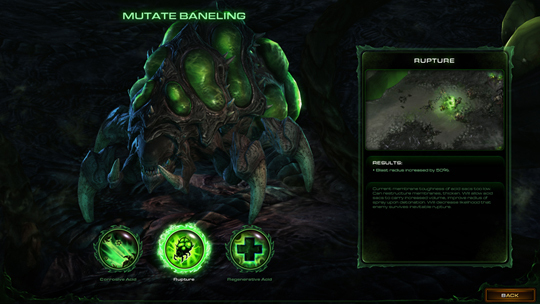 Unsuspectingly, the Zerg momma plays a large role in Heart of the Swarm, but not just in the story. Past Blizzard RTS games have struggled a lot with how to properly use "Hero" units, but I daresay that they've finally got it near perfect. It plays out a lot like Warcraft 3, but much better. Basically, Kerrigan is present in just about every mission. At the start of the game she is strong, but not amazingly so, and cannot die. However within a few missions you start controlling a proper Zerg base, and then death is less of an issue. If she falls, Kerrigan will simply burrow to the nearest Hatchery and respawn after a short time. This makes it feel like you don't have to obsessively baby sit her for fear of a game over. In addition to this though, she get's significantly stronger over the span of the game. As you complete missions and bonus objectives you will earn "Kerrigan Levels", and unsirprisingly each one increases her stats. Additionally, every so many levels she gets access to a new ability tier, wherein she can equip one of two (later three) abilities, with the ability to change them out between missions. By the end she is an absolute beast, and it really lends a lot to the feeling of progression. This is important, because Kerrigan's power growth is at the center of the plot. This would be where I would normally talk about the plot, but before I do so, I want to pontificate a bit more about the gameplay. Specifically, mission variety. Wings of Liberty had a lot of it. Each mission is very memorable (whether for better or for worse). Heart of the Swarm really takes it to the next level though, in my opinion. Not only is every level memorable and unique, they are all fun. Wings had some pretty horrendous missions, but I can't say there was a single one in Heart of the Swarm that I disliked. Blizzard has also managed to pump every ounce out of creativity out of the engine on this one. In particular, there were several "infiltration" style missions, which focused on controlling a single unit or group without a base. Traditionally I don't tend to like these types of missions, but Heart of the Swarm did them right. Controlling these special units feels exhilarating, and it makes you really feel like a badass, rather than punishing you for taking a wrong turn like back in the Starcraft 1 days. They even have a mission that feels incredibly like Diablo III, right down to a "boss" who is incredibly reminiscent of Belial. Indeed, there are a few instances of "boss fight" like encounters, which go above and beyond "here's a unit with a ton of health". There are even a few missions with DotA style play involved. All in all the missions are just really enjoyable and have lots of interesting thigns going on. Though they do suffer from the "here's this new unit, build 9999999 of them to win" syndrome a tad, as well as being a bit too easy. This brings us round to the issue of the story. I say "issue" because to be frank, I'm not a big fan. I vividly remember the end of Wings of Liberty. The whole game lead up to this intense struggle against the Zerg, a battle against all odds with no real indication of what was coming at the end until late into the game. It ended with an incredibly epic standoff that required every bit of your skill even on easier difficulties. In the end somehow against all odds Raynor managed to not only beat back the Zerg, but also get Kerrigan back. This went far beyond the "good guy getting the hero" thing. She was the enemy for two whole games, the big bad. Yet in the background of all of this, there are inklings of a greater threat that never really gets much explanation. As Raynor walks into the sunset of Char, I distinctly recall wanting to play Heart of the Swarm then and there. I wanted to know what newly human Kerrigan would be like, how people would react to her. What would the state of the universe be without the Queen of Blades, this being the first time there was neither her nor the Overmind? How was she supposed to be the one hope against whatever dark force was creating the Zerg/Protoss hybrids if she didn't have her amazing powers any more? After playing Heart of the Swarm I find that I don't have that same insatiable desire to play the next game (Legacy of the Void). I also feel as though Heart of the Swarm was a bit of a let down in regards to all the other questions I had. The plot doesn't really do one single thing that turns me off, it's more a series of things. First and foremost I think is just the fact that the plot focuses so intently on Kerrigan. While I think this is great for the gameplay, it makes the story less interesting. Throughout the game you never really have much sense of what's going on in the rest of the universe. Perhaps this is some narrative thing that's supposed to mimic how alone Kerrigan is, but that doesn't make me like it. Basically Kerrigan thinks Raynor is dead for most of the game, and so within a few missions she has returned to the swarm, and within a dozen missions she even turns back into the Queen of Blades. Ok so technically she's stronger than before, but she looks the same, which is also lame. To me this just seems like a slap in the face to the entire first game. Yay we saved Kerrigan! Oh wait, no, she's back to being crazy Zerg lady. Well, damn. Just to add insult to injury, Raynor has maybe a dozen lines in the entire game. This is especially painful after he discovers that Kerrigan has been re-Zerged and regathered the Swarm just to save him. He barely has two words for her, and it just feels wrong. I want to hear more from Jim. I know it's the Zerg expansion and it's all about Kerrigan's strive for power, so that she can exact her revenge and all jazz, but that story line isn't as interesting to me. Yea, we know she wants to kill Mengsk, it's not a surprise that the end of the game is storming Korhal just to kill one man. What I want to know is what Jim really has to say. Enough harping about that particular plot point though. I also mentioned how the game feels secluded and lonely. This touches on what I think is the less noticeable, but perhaps more important contributor to the story's stumbling. Pacing. Heart of the Swarm is a lot more linear than Wings of Liberty. That in itself isn't a big issue, but Wings got some real mileage out of it's open endedness. All throughout Wings there was this sense of impending doom, of something big ramping up. You weren't even really sure what it was, but at the same time you were constantly pooling forces and gathering allies that would eventually help you assault Char. It felt like everything lead up to that glorious last stand, and Heart of the Swarm has none of that. There is no mystery, there is no tension, there is no glorious last stand. Kerrigan spens the entire game just gathering the scattered brood, increasing her power, and on the offensive. It may be the Zerg's way, but it's somehow boring, and somehow feels like less of a concerted effort. It doesn't feel like you are struggling for survival, which isn't helped by the fact that the Hybrid are barely even there. Oh hey yea, there's the hybrid. Shoo, I don't have time for you, I need to go kill Mengsk now. Perhaps I'm overstating my dislike of the story a bit here though. Kerrigan's storyline itself is... I don't know the word, honestly. It's been a long time since we last controlled her, and back then she was the bad guy. At the time I honestly never thought anything of controlling the bad guy, it just felt like another part of the Starcraft universe unraveling before me. She really does get jerked all over the place. Here in Heart of the Swarm she's finally (mostly) regained her human form, she's briefly reunited with the man she loves, but then she promptly loses it all again. She's forced back to the swarm because it's the best and only way to raise an army. It's unthinkable, but she's also the only one who can do it, and it's necessary if she wants to save Jim (oh yea, and the unvierse, but not until Mengsk is dead). She literally sacrifices everything, and if this game's story does one thing right, it's making you feel the weight of that burden, even if it kind of feels like a dumb decision. Probably the most impressive feat of the story though, is that it has somehow turned the Zerg into the unlikely heroes. You aren't playing the bad guys any more. Kerrigan may be the Queen of Blades again, but her will is entirely her own. As monstrous as the Zerg may be, they are technically now on the side of good, and all indications are that they are the universe's only hope. How that will play out given that the last game in the trilogy focuses on the Protoss... Well, I have no clue. Aaaaanyways, that's about enough of that. The title of this article says "Thought Dump", and it's quite literally been just that. If you actually read this far, praise be to you. Somehow this post ended up even more rambly and less concise than normal. All told though, I think Heart of the Swarm is a great game. Even with all of the issues I take with the plot, I still think it's a better game than Wings of Liberty just on the merit of the gameplay. It was more fun to play, even if it hasn't left me longing for Legacy of the Void. Though in truth, I'm looking forward to it all the same, not so much for the story, but to see what cool things Blizzard can do with the Protoss (probably my favorite race). Now, I think it's high time I stop typing.